"Dramatically Accelerate YOUR Learning and Be Playing Your Favourite Songs After Your Very First Lesson"
Do the guitar lessons follow on from each other throughout the WHOLE course by the SAME tutor, in a chronological order taking you from one guitar lesson to the next seamlessly, ensuring you don’t get confused and left wondering what comes next or where do I go from here? Will they get you from where you are now to becoming a GREAT player in the FASTEST time possible with no confusing technical jargon you are not ready for? Are the lessons EXTREMELY EASY to follow. Has the tutor decades of teaching experience with PROVEN results and a GREAT track record? Think about this, and it doesn’t just relate to guitar teachers – It’s OK for the person teaching you to be a great player, but can they teach??? Some guitarists even though they are outstanding players DO NOT have what it takes to be able to put it over and communicate in an easy to understand manor so you progress quickly and easily with no hiccups. A carefully structured revolutionary teaching method… A method I’ve proved time and time again to be extremely successful with a wide variety of students. Young, Old, Male, Female – it doesn’t make a blind bit of difference… You are Guaranteed to be successful with this Fast-Trac PROVEN system. This incredible learning program by-passes conventional learning techniques and brings out the very best in you VERY quickly indeed. In fact you will be playing the guitar at the end of your very first lesson!! When Evan went for his first lesson with Mike, he had never played a musical instrument in his life. Now he has a realistic chance at a career in music. 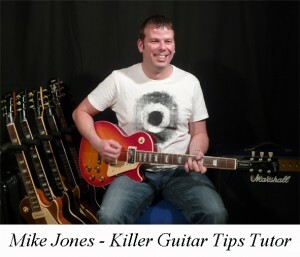 Under Mike’s expert guidance and instruction, he has progressed from learning chords and simple sequences to writing unique riffs and entire original songs. While encouraging Evan to perfect the basics, Mike has kept him challenged and motivated by introducing him to a variety of styles from blues to classic rock, pop and modern rock. Additionally, he has shared his knowledge about the practical aspects of playing in a band. I could not have wished for a better mentor for my son! 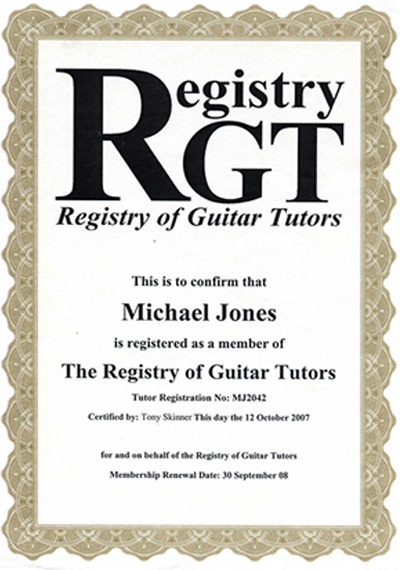 Hello, my name is Joe ,and I am currently taking guitar lessons from teacher Mike Jones (no relation to Tom) from Oldham, UK. And I have to say, I am at this moment enjoying the lessons very much. Mike’s teaching methods are very easy to follow and relaxing. So as a consequence I have surprised myself beyond all expectations, and can actually play several tunes.So to any young or old people out there thinking of taking up the guitar, or improving on existing skills, I would not hesitate to recommend Mike. As a teacher he is quiet and helpful, a very good listener, and best of all he treats his job as a vocation, and as such makes it part of his life. He usually goes straight into the lesson and not a moment is wasted. I leave every time wanting to stay (I wish school could have been like this) and carry on playing. My son looks forward to his lesson every week. Mike has a very good teaching technique which is accompanied with patience and understanding. With all this comes a terrific sense of humour, which makes each lesson a pleasure to attend. And how come my teaching methods and techniques used in this amazing guitar course are probably MORE SUCCESSFUL than any other course out there… Period!? So How Come It’s Me That Will Get You To An Awesome Standard in The Shortest Possisble Time??? Well let me give you some back ground about myself, but before I do, I would like to state that this is definitely NOT to impress you or boost my ego “I’m well past all that rubbish.” It is to impress UPON YOU that what I put over in the course is taken from over 20 years in the business, playing as a PRO GUITAR PLAYER with numerous bands, duo’s and big bands. On top of this I have taught hundreds of guitar players to attain a level anyone can be proud of and be able to stand up on stage, fit in with the band and produce killer guitar riffs that will blow your audience away! I am not some young pup who has been playing for a few years and decided to jump on the bandwagon (pardon the pun) to try to make a few bucks with a guitar course on the internet. I have taken real examinations achieving the highest of standards. I am 43 years “young” and guitar playing has been, and still is my life…period! I do not have another job and supplement my income by playing the guitar – GUITAR PLAYING IS WHAT I DO. I have over TWO DECADES of teaching and pro playing experience… I would be so bold as to say if I cannot get you to a great standard punching out KILLER RIFFS and amazing your friends with your new talent then no one can! You’re getting access to over 21 years of testing, failing, tripping, winning, trying… and everything else I’ve needed to refine my own approach to providing a guitar course that simply cannot be beaten in taking the beginner through to Killer Guitar player in the shortest period of time. And assuming that collectively (and this is on the low side) I have spent approximately 7 hours per day, 5 days a week (yes I do take a day or so off in the week! ), for those twenty eight years means that I’m practically giving you the same strategies that took me over 50,960 hours to perfect. Now that’s a lot of hours! We are so confident this course will work for you that we are prepared to offer this OUTRAGEOUS 100% NO-RISK, Iron Clad, Money Back Guarantee that is unmatched on the internet or anywhere in the world (as far as I am aware) for that matter! You could go for guitar lessons to a local guitar tutor (don’t get me wrong there ARE some VERY GOOD tutors out there) who will charge you anywhere from $20 – $50 (£15 to £30) for a single 1 hour quality lesson. And from the average tutor you would need a lot more than 7 hours to become a good guitar player, as I can almost guarantee they will NOT have the tips, tricks and strategies that I have built up over two decades of playing the guitar professionally! “Good” guitar tutors are few are far between and finding one can be a nightmare! Conventional learning can equate to Thousands of Lost Dollars acquiring your skills. Look at it this way (and I shouldn’t really be saying this)… Do you think most tutors are going to bring you along as quickly as possible? NO!!!! Definitely NOT, they want you to be with them for as long as possible to squeeze as much money out of you as possible, hence they will bring you along at THEIR pace NOT YOURS!!! When talking about Professional guitar players, the word “Professional” means they get paid money to perform their art, this is how they earn their living. So, when a new guy comes along for a lesson, do you think the tutor is going to push them along as quickly as possible? They’ll drag their feet and only give you the bare minimum of instruction, just enough to keep your attention. This allows them to pull in more money over a longer period of time as the student supposedly needs MORE lessons… What a rip off!!! 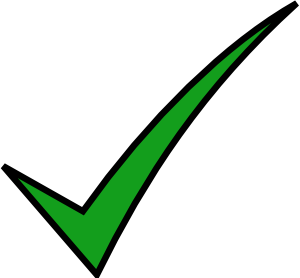 There are of course some very reputable tutors out there but finding them is like finding a needle in a haystack! With The Killer Guitar Tips Home Study Course – YOU KNOW UP FRONT Exactly What You’re Getting! You will get 7hrs of intense guitar lessons broken down into 14 DVD’s consisting of one module on each DVD a half hour in duration PLUS extra footage and more! Why do we put the course out on DVD??? For the simple reason; you don’t have to rely on a good internet connection to study the course… It can be played ANYWHERE – on a boat, in a tent, in your caravan, on holiday, on your TV or any other place you have access to a portable DVD player or computer. You’ll receive one DVD each month until you have completed the course and have built up a one of a kind archive of cutting edge material that can be accessed over and over again at any time of your choosing. The lessons are intense but easy to follow, unique learning techniques that will catapult your guitar playing into the next stratosphere. You will not be fed some semi useless information just to pad things out, or theory that only the very best, top classical guitar players need to know. All the information and instruction you will be given are absolutely 100% essential if you are to become a killer guitar player in the fastest possible time. Killer Tips and Tricks that will bring your playing on leaps and bounds in no time at all. In a Structured chronological order. 14 half hour step by step lessons (7 hrs in total) that effortlessly flow from one progression to the other bringing your guitar playing on to a level you only dreamed of – very quickly indeed. Secret chord progressions only you will know that fit seamlessly with certain keys to make you sound awesome when soloing. Killer techniques including hammer ons, pull offs, bending, sliding and flashy leads to blow your audience away. An absolutely unique technique to develop lightning fast hand speed in no time at all. Discover how to read tab music so you don’t need to read sheet music to play your favourite songs with ease. A secret, private download area where you will have privilege use of to access learning aids and tools specifically designed for the “Killer Guitar Tips Home Study Course. The problem with either travelling for a guitar lesson or having a tutor come to your home is you have to have the lesson at a predetermined time. This will probably screw up your day and everything else has to work around it. Wouldn’t it be nice to have a lesson when YOU choose to have one, at a moments notice? Your tutor may not necessarily be into the type of music you love to play which means that you’ll not enjoy your lessons as much as you could, which in turn means that your learning will not progress as quickly as it should. You need guitar tuition that suits YOUR type of music… That YOU enjoy. You Will Have Access To Tips And Tricks That Only The Worlds BEST Guitar Players Know! You will have access to all the tips, tricks, secrets and skills used by the top guitarists throughout the world like: Eric Clapton, Jimi Hendrix, Slash, Santana, Mark Knofler, Joe Satriani, Steve Vai, Dave Gilmore, Jimmy Page or BB King and many more… All these musicians have had to LEARN these skills, they were not god given, they did not have any magical powers, they simply put in the hard graft. BELIEVE IT OR NOT – YOU HAVE AN INCREDIBLE ADVANTAGE OVER THESE PLAYERS! Why Purchasing ‘How To’ Books Don’t Work For The Guitar. Most people learning the guitar end up seeing a book for sale in a shop, it promises to teach them certain skills and techniques, and there is nothing wrong with this apart from – you may not be at the level to follow the book successfully. It starts off by assuming you know absolutely NOTHING about guitars, WHAT IT DOES ASSUME is that you have a burning desire to become an awesome guitar player, this is all I require to get you started on your path to becoming a Killer Guitar Player. And because you will be sticking with me and me alone, your techniques will be finely tuned and geared to progress in the fastest possible time. It will take you through the whole process step by step from beginner to Killer Guitar Player, your friends will be amazed at how fast your guitar playing is coming along! So Where Does This Leave YOU??? Looking around for great tutors – few and far between. Knowing you have a lesson coming up shortly and have not had time to practice – For reasons beyond your control. Travelling to your lesson – Takes up valuable time from your busy day. Buying DVD’s, Video’s and Books – Don’t have a structured progression by the same tutor – will cost a small fortune to get anywhere IF you could find a course that produced results. Can’t get motivated at home in between lessons. Feeling nervous before your lesson. A FAST Structured Progression that is VERY EASY to follow and understand. A course of lessons created by someone who has a vast experience in the music industry, is a professional (gets paid for playing the guitar), knows what he is doing and is not some wizz kid who has learned the guitar, played for about 3-4 years and trying to cash in and make a fast buck. A course you can study and take part in, in a nice relaxed environment with no pressure put upon you, helping you to progress at lightning pace because you are in a cool, relaxed frame of mind. A course of lessons that you know you CAN afford and you know will be great value for money ensuring you’ll not get ripped off. A Solid, Cast Iron, No Questions Asked, FULL Money Back Guarantee. Just ask your guitar tutor for your money back once he has given you your lesson! It’s not repeatable what he’ll say!!! Lessons that you can refer back to over and over again that will inspire and motivate you with audio, video, illustrations and downloadable teaching aids. All The Fast Track Short Cuts The Professionals DON’T Want You to Know. Something that is VERY clear is that conventional lessons are now a thing of the past. In this fast moving society we now find ourselves, we need to be able to learn, play and progress at our own pace, at the time we want, in the place we want and with the best tutors, achieving the best possible results and FAST. Well, thanks to the internet times have changed. You can now have all of the above and have it FAST. You will be able to be blasting out your own favourite tracks, riffs and licks in no time at all. And you will get EVERYTHING mentioned above PLUS some AMAZING FREE Bonuses I have decided to throw in for you but ONLY if you REGISTER for FREE today – I will throw them in absolutely FREE OF CHARGE! Practice Bonus… Specially formulated footage geared to fast track, no nonsense learning strategies that work! You’ll be getting a MASSIVE $421 (£275.00) of FREE Bonuses and you get to keep them regardless but ONLY if you REGISTER For FREE within the next 24hrs!! NOW, IT HAS NEVER BEEN EASIER! YOU too can now achieve amazing results…With this incredible home study course and all in a very short period of time indeed using these absolutely unique proven, time tested speed learning techniques. To Become a GREAT Guitar Player! 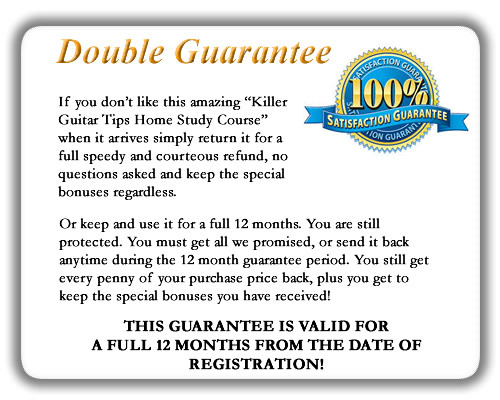 "The Killer Guitar Tips Home Study Course"
With your DOUBLE 100%, no questions asked, iron clad, money back guarantee – AND IT’S VALID FOR A FULL 12 MONTHS you have NOTHING to worry about – WE take all the risk away from you. Just click the order button below and I’ll send you your first module by return, you will be up and running playing your first riffs by the end of module one… GUARANTEED! REGISTER for FREE without delay to receive your $421 (£275) of FREE Bonuses! This is a professional production brought to you on DVD so you may collect the DVD’s you receive each month and build up into a cherished archive. You will receive one module each month by conventional post, but don’t panic we ship world wide hence the price is in US dollars. Once you have registered for the full course, you will have an incredible archive of groundbreaking techniques and strategies that you can refer back to over and over again. Guitar playing and the methods used in this course do not go out of date. You will have an archive of GROUND BREAKING material that will last a lifetime! This course is the only way you are going to be able to FAST-TRACK your way to achieving your dream. This is your once in a lifetime opportunity to do something amazing, and something you’ve always wanted to do – Play The Guitar Like A Pro and amaze your friends! By Enrolling on This Incredible Program You Will Achieve a Level of Success Others Can Only Dream of! You see, I have to start with a price I think is great value for money for my students and also (I won’t pull the wool over your eyes here) a price that will be profitable for myself, as like the rest of us, I have to earn a living and guitar playing and tutoring is what I do! For The First 30 days! Try this incredible course for 30 days FREE of charge, if you don’t like it for ANY reason whatsoever simply send it back anytime within the 30 day period and you will not be charged a single penny! We Have Taken Out ALL The Risk. Compare the cost of conventional guitar lessons from a tutor. Within the month you will be paying easily 3 times this amount as most tutors encourage you to have a lesson once a week at a cost of anywhere between $30 to $40 (£20 to £26) for each lesson, that equates to at least $120 (£80.00) PER MONTH! And You will probably not get cutting edge material that will blast your guitar playing into the next stratosphere and blow all the competition out of the water! It will be just like having yours truly sat in the room with you as many times as you like showing you these Killer Guitar strategies, tips, tricks and progressions that have taken me over two decades to perfect. Pour My Heart Out To You! You’ll be getting a no holds barred, no stone left unturned home study course showing you the mistakes you are going to make or rather would make before you even make them! You will be sent one DVD each month that will follow on from the previous, giving you a structured progression geared to bringing your guitar playing on as fast as humanly possible.. If you wish to progress as fast as possible DO NOT follow any other program while enrolled on this course. 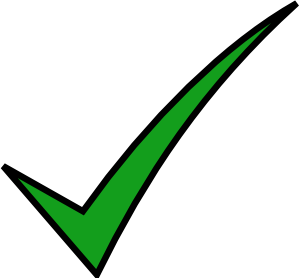 It is geared to use certain techniques in a predefined order to bring you on as fast as possible. DO NOT get thrown off track! You will also get access to a secret download area allowing you to download unique “Killer Guitar Tips” and teaching aids specially designed for this course. The download area will be updated on a regular basis. THIS IS THE BEST CHANCE YOU WILL EVER HAVE to be able to learn the guitar as quickly and easily as possible, believe me you will not get a better chance than this and all for just $47 per month – the price of a few drinks in the pub. So Who Should Take The Course? Beginners and also intermediate guitar players who are frustrated and don’t seem to be getting on as quickly as they’d like (but be prepared to go back to basics in order to recondition your mind), young or old – age is of no consequence, the course is for people who are keen to learn and progress as fast as possible. But please start with an open mind, much of what you will hear will be unique and even shocking to you. Who should not take the course? Those who do not place a high value on real world, cutting edge guitar training. 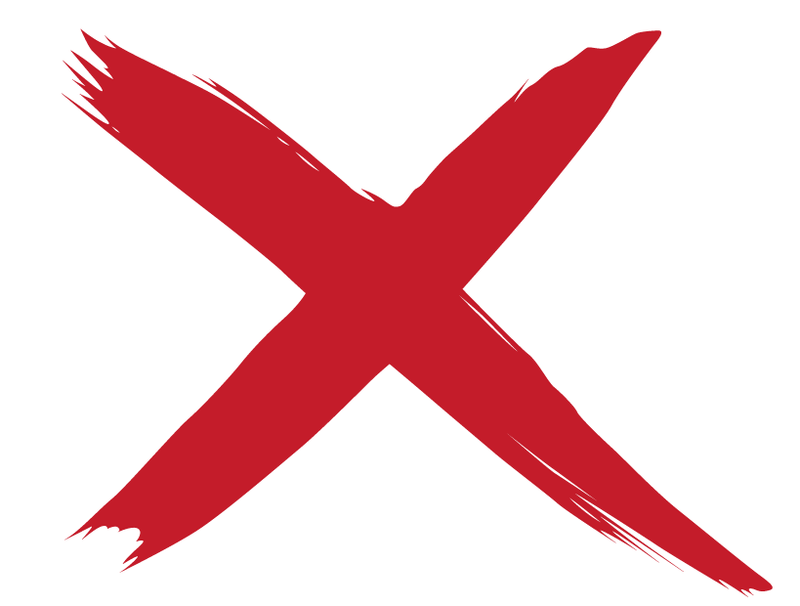 We do not want whiners, complainers, know-it-alls and anyone who sees themself being not responsible for their guitar playing progress and unwilling to learn change. Mike has helped me tremendously to develop the fundamentals of playing guitar, covering areas such as technique, musical theory, composition and recording. As I became a more competent guitarist, Mike helped me to further enhance my skills as a musician by introducing me to performing live at different venues within the local music scene, starting with open-mic nights and eventually leading to playing gigs.The learning experience came full-circle when, with Mike’s aid, I myself also began teaching guitar. 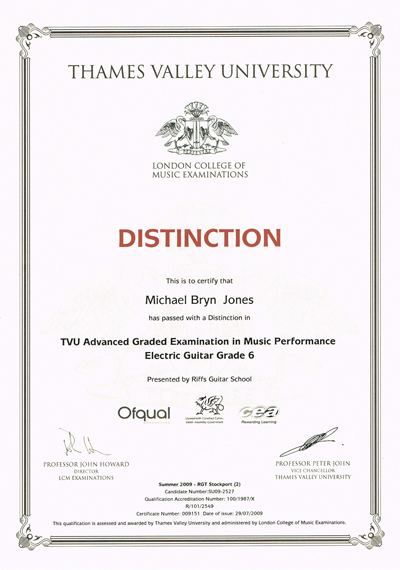 Although I have analysed many musical styles through self-study since I began learning guitar, I admit to basing many of my own teaching practices on the methods that Mike uses.I feel comfortable playing many different styles of guitar in varying genres of music, and enjoy playing with other musicians. Whatever setting I find myself playing in though, it is the knowledge that Mike passed onto me that enables me to feel comfortable in these different musical environments. Mike has been a great musical influence and a great friend, and I would recommend him as a tutor to anyone that’s interested in entering the world of playing guitar. You can register for FREE NOW and claim your FREE bonuses listed above – value $421 (£275.00)! You can delay registering and choose to enroll later but forfeit the $421 (£275.00) of absolutely amazing FREE bonuses. You will still have access to the full course with everything it has to offer, it just means you will not be sent the “not to be missed” FREE bonus offer. Whether you order now or later, register on my “Killer Guitar Tips Home Study Course”! It’s the ONLY way you are going to become a great player in the shortest possible time. If your are not 100% satisfied at any time within the next 12 months, let me know and I will refund your money in full… I simply cannot be fairer than that, that’s how confident I am that YOU WILL BECOME a Killer Guitar Player! Follow the course to the letter and you simply cannot fail! For your convenience simply click the ‘Register For FREE’ link below and you will be able to pay with your credit/debit card or your PayPal account. NOTE: Your PayPal account or Credit/Debit card WILL NOT be debited for the first 30 days. Register For FREE without delay to receive your $421 (£275.00) of FREE Bonuses! So there you have it, I’ve tried to give you as much information as possible for you to make an informed decision as to whether the course is for you. I do hope you choose to join us today and may I take this opportunity to wish you every success in which ever path you wish to take in your guitar playing endeavours. The main thing is you enjoy yourself! PS: The “Killer Guitar Tips Home Study Course” will make a MASSIVE difference in your life by catapulting your guitar playing into hyperspace. If you are looking for a FAST-TRACK method to becoming not just a good guitar player but a GREAT guitar player then you need to act fast. You risk nothing. We will keep the course at just $47 per month for the duration of the course for you with no price increase and you are covered by our incredible 12 month money back guarantee! But only if you act NOW! PPS: If you register for FREE NOW we will not only keep the price to just $47 per month for you but will also throw in not one, but THREE very special FREE bonuses worth $421 (£275.00), you may keep these regardless! REGISTER FOR FREE at once to take advantage of all the above and REMEMBER: You pay NOTHING for the first 30 days! You really do have nothing to lose and EVERYTHING to gain!